The last person I focused on in my Bachelor’s Degree Senior Thesis was was the german designer Otl Aicher. The image above is actually what gave me the idea to post portions of my thesis to the web. My parents gave me this poster for Christmas this year. I’m not sure if it’s an original or not (probably too affordable to be original) but it’s the fencing poster for the 1972 Munich games. You can get yourself a poster here and read more about Otl Aicher below. Otl Aicher was a German designer whose work has been enormously influential in many areas of design. Like Rand, he understood the need for simplicity and clarity in his work. Yet, rather than making a simple mark to represent a company, he created entire visual systems that were minutely controlled. 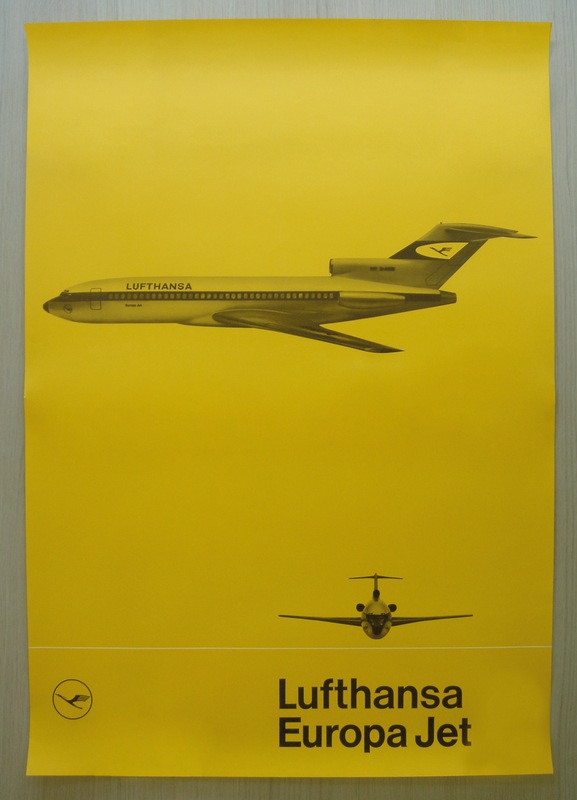 His work on Lufthansa Airlines is still largely utilized today, decades later (see Figures above & below) (411). He redesigned their crane logo, making it sleek and simple, and thus reproducible across a range of applications. Helvetica was chosen as the typeface. Once seen, their logo is easily remembered. 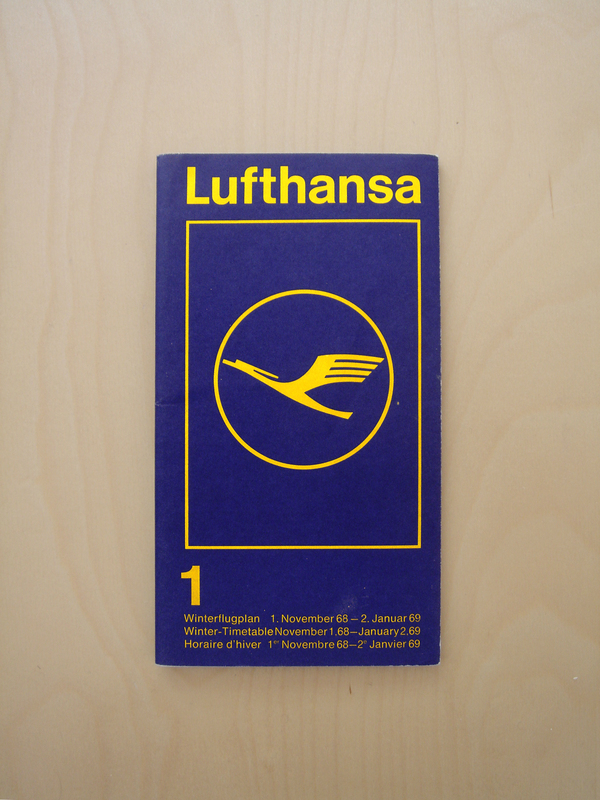 Aicher did not stop with the logo, but designed how the mark would be displayed on the airplanes themselves. His chosen Lufthansa colors were implemented in the uniforms for the flight attendants. He designed ticket stubs and itineraries, as well as, promotional materials (Rathgeb 62–71). All elements fit nicely together due to Aicher’s forethought in the design of their collective system. Aicher’s knack for visual systems caught the attention of the 1972 Munich Olympics, he was hired as head designer (78). Although the Munich Olympics are remembered worldwide primarily for the Black September terrorist attack on the Israeli wrestling team, the design world remembers Munich for the introduction of the now ubiquitous Olympic pictograms (see Figure below). The consistency of the visual system for the 1972 games, makes Munich one of the most memorably designed Olympics. Aicher began with a distinguishing mark for the Olympiad, a seashell pattern of repeating shapes. This mark was used in addition to, and sometimes in place of, the traditional Olympic hoops (83). He then created posters for each type of event using easily recognizable photographs in bright posterized colors (see Figure below). To overcome language barriers, Aicher created a series of simplistic pictograms representing each event (82). Variations on and iterations of these pictograms have been present in the Olympic Games ever since. Following the Olympics, Aicher expanded the use of simple pictograms for the visual design of the Munich Airport (114). Through these applications, he demonstrated the usefulness and necessity of using design for a successful and ordered society. After his successes in Munich he went on to create two typefaces, build visual systems, and design books. His work is an example of improving quality of life by communicating clearly through design. Aicher’s talent is not personified in any single design, but rather in the planning and thinking that unified many smaller parts into a cohesive whole. Upon researching Bass, Rand, and Aicher, three prominent figures in the modernist movements of graphic design, it is clear that sound thinking produces the concepts that are present in sound design. These concepts are adaptable to any application, and effectively communicate the intended message. Meggs, Philip, and Alston W. Purvis. Meggs’ History of Graphic Design. Hoboken, New Jersey: John Wiley & Sons, Inc., 2006, 357–423. Rathgeb, Markus. Otl Aicher. London: Phaidon Press Limited, 2008, 62–114.